What I was doing while Aabi was archerering. 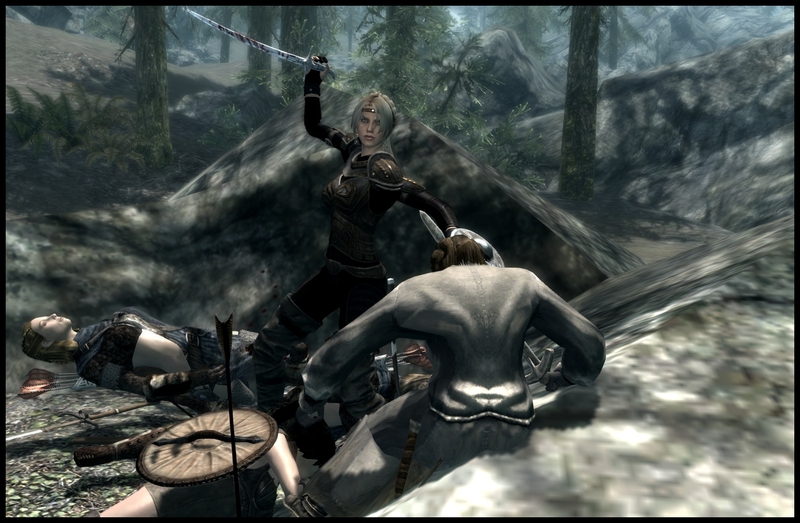 Vampires piling on while I was playing with the Stormcloaks. Cowards. Glaring at Aabi didn't help. She was unimpressed. Don't blame you on excluding bean salad, it's a recipe for digestion disaster. Nice action capture--I always forget to hit the console button to stop the action until it's too late. Actually game was frozen while I was taking shots of Aabi bowshooting the stuff Yens was tanking. I looked around and saw Yens in that pose lol. Not very planned at all. The inadvertent shots are almost always some of the best ones. That sword grip looks all wrong. Have a word. She actually flipped the sword in her hand. Part of the kill move animation. Looks better with a conventional sword. This kill move ends up stabbing downward into the chest.